Heavy Handed IPA is brewed to celebrate the harvesting of the hops every year. Within moments of harvest we add freshly picked "Wet Hops" to this IPA. Since the hops have not been dried before use, they add a wonderful character found in no other beer. A hop lovers dream. (Available September through December) Each batch is "single hopped" with a different hop variety. This IPA pours a brilliantly clear beautiful copper with a thin white head with good lacing. The aroma is moderate-high citrus hops and a moderate toasted malt and medium sweetness. The flavor is very hoppy, pine and grapefruit, with a subtle sweetness in the background. The hop bitterness is modeate-hight. The mouthfeel and swallow are very smooth. Carbonation is medium and body medium-full. Overall a very hoppy, well done IPA. I especially like the smooth mouthfeel and impressive hop flavor. I couldn't drink more than probably two in a sitting, intense flavors! Poured into a pint glass at room temperature this one is a clear light copper color with a fair sized off-white head and a bit of slithery lacing. The aroma brings a lot of malt and some herbal hop, maybe even a touch of cotton candy maple syrup going on. The taste offers a sweet blend of maple malt and herbal pine hops. There is some grassiness that isn't helpful but it's mostly a sweet malt and hop blend with a solid mid-body feel and quite drinkable. It's close to being a very good IPA but it seems a bit young and unfinished to me. Not bad though and worth a try. 1st review! Picked this bottle up at the Cardinal Liquors in Shorewood as part of a Mix 'n' Match 6 pack. A - Nice amber orange color with some haze. S - The hops are there but they're not demanding my attention. T - Hops and caramel malt. Nice balance on this beer, not too bitter for my taste. I'm getting this odd lingering citric sweetness that seems to stick to my palate. I recently ate orange cranberry carmel corn and the resemblance on the aftertaste is uncanny. This might be off-putting for some but I quite enjoy it. M - Rather light and crisp. Decent carbonation. D - Easy drinker here. I definitely consider this a session beer as I would have no problem knocking back 3 or 4 at a time with a pizza and wings. Overall I really have nothing bad to say about this beer. On the other hand, I don't have many praises to sing either. It's a pretty average beer in my mind, but one that I would not mind trying again in the future, perhaps on tap at the brewery. Had this last season, and it was good then too. The malt background is sweet, which pairs nicely with the abundance of hops- it allows the flavor and aroma to come out more than with a heavier IPA. It has such a smooth mouthfeel- one of the better characteristics. The hop profile is nothing special (though it's still very good), but it is so well balanced that the freshness of the hops is accentuated over the bitterness. Quite good. This is no fair. I'm rating this beer after drinking a prized Bell's Hop Slam, number 2 of 12 for 2008 (10 more reasons to proclaim 2008 the best year ever). Oh, this poor beer never stood a chance. I could describe its characteristics, but, in fact, there aren't many to be had. It's darker than I expected--very red for an IPA and a little cloudy. I like it. It's bitter, but difficult to get ahold of--more bitter than citrus. Very little head, some lacing but not much. Again, this review is no fair. Cursed Bell! Smells of bright, citrusy grapefruit hops, with a noticeable undercurrent of sugary malts and caramel. On the tongue, there's an immediate shock of bitter hops, which are set at medium to medium-heavy bitterness (65 IBU), bringing about that lovely grapefruit buzz that is the domain of hoppy beers and IPAs. This subsides slightly after a couple of seconds to reveal a nice malty backbone, full of sugary caramel flavors and brown sugar notes, as well as piney swirls. The aftertaste is mostly hops again, but a thin vein of toasted grains runs through it. Overall, I thought this was a lovely IPA, with good, strong bitter notes, as well as nice malty counterpoints. Many IPAs seem to focus only on the bitter shock of hops, and this one nicely provided the countering sugars to remind your tongue of the other side of the equation. Much time and effort were obviously put into this, and the result is a finely-crafted, very drinkable beer. Pours a burnished bronze-ish amber. Nice head and head retention (white). Smells like grapefruit hops and malt. Mmm....I've been getting a bit of a pine overload from my last few drinking sessions ... bring on the grapefruit. Good clean malty background with some delicious grapefruit hops and maybe a hint of some sweeter fruits ... tastes like mango, maybe. Very good, wish I could find it locally. 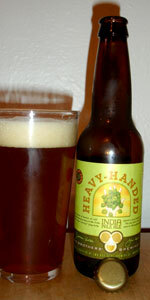 Two Brothers did (6)versions of Heavy Handed in 2010, each brewed the same except for a different hop variety. Did a semi-vertical of (3) versions. I tried to collect all six, but drank em up . This is a very cool way to educate myself on the characteristics of hop varieties. I don't know of another brewer who does somehting like this. And oh by the way, this is a awesome IPA. Well crafted, top notch ingredants, perfectly balanced, and the lucky strike extra is six similar versions of the same thing. on draught at small bar (division) release event Sept 2007.
ruby orange, barely any head, tiny bit of lacing. Aroma is surprisingly mild-- mellow caramelly tones and subdued hops barely hint at what is to come. It's made with fresh hops, and maybe not dry hopped at all or something. mouthfeel was a shocker based on appearance: an explosion of tiny bubbles appearing out of nowhere. creamy viscosity. hops all over the place, offering an interesting sensation of discrete taste bud regions on my tongue. pine, grapefruit, herbs (thyme, rosemary), spice (nutmeg, coriander, black pepper), sweet toffee backbone. finish is a bit of hop mish-mosh-- the weakest part of the experience, but hardly disappointing. easy to drink, but a fair kick after a few. A- Pours a beautiful orange amber color with ample sediment. The head is 2 fingers in height, a creamy white color, and leaves some sticky lacing on it's decent. S- Very nice fresh hop aroma. Notes of pine, grapefruit, and slight apple. A nice balanced malt comes through as well. T- Starts out with a big malty grapefruit, thick in feel, then moves into a big maltiness with notes of apple and peach. The finish is big malty with a residual fresh hopiness. D- This is a very malty IPA. It has good balance and is very neat as it's wet-hopped. I'd drink this again.